Greetings all on a new week! I have lots going on this week, including a big MEET UP WITH SAMANTHA!! More on that to come later this week. But I'm terribly excited! Going into this week, for whatever reason, I've had Bible study and reading plans on my mind. I'd like to read some Scripture each day, even if it's only a small snippet. So, I was on Amazon this morning, surfing for Scripture reading plans. I came across a number of interesting titles (like How to Read Your Way to Heaven) and had in mind to find a plan I could use with my existing Bible (the beautiful Catholic Women's Devotional Bible). I'm definitely intrigued by How to Read Your Way to Heaven, which includes not only a Bible reading plan, but also the Catechism as well as other important spiritual works, but right now I really need something SMALL. :-) Just a way to organize myself each day to read a little Scripture. As I was searching I realized that my Bible *does* include a reading plan in the back, I'd just have to flip back and forth to find the necessary verses each day. Plus, happening upon Daily Mass Readings books on Amazon reminded me that I also have a subscription to Magnificat magazine. So I do already have a few tools at my disposal. This caused my little mind to be all awhirl. A Catholic Journaling Bible (for Psalms and New Testament, and there is also one for the Old Testament). Cindy!!! I immediately thought of you! :0 Cindy had mentioned in the comments of the journaling post that she loved the idea of a journaling Bible, wherein you could write your own notes in the margin, but that she hadn't yet come across a Catholic one. These are brand new, came out in 2017. They include pages for painting or coloring, and a wide margin with thick paper for drawing or writing on each page. It's only *11.69* at Amazon right now for the New Testament volume! The Old Testament is more expensive at $29.99, but that makes sense in terms of length. What do you think, are you all intrigued?! I'm tempted to order the New Testament volume! My only qualm is with the font layout and size. Go read the comments over at Amazon and you'll see what I mean. There are no paragraph breaks aside from chapters, and the text size is somewhat small. So it's just low rows of continual text. That might be hard on these already compromised eyes, I'm not sure. But I LOVE the concept of this and wanted to show you all! What do you think of this idea? Also, do you have a Bible reading plan? Which Bible do you use? I'd love to hear from you in the comments! Yay! 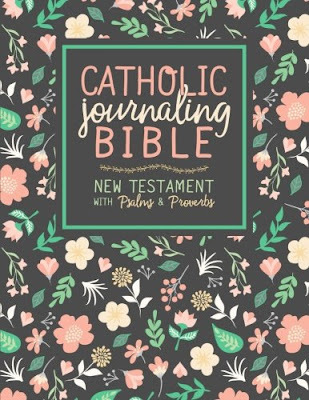 A Catholic journaling bible!! I didn't see this one in my earlier searches. I have 40+ year old eyes too, so the small print is discouraging but I like the fact that the pages are really thick. I'm tempted to order it and try the New Testament anyway, especially for that price. Let me know what you decide to do. The Old Testament one just came out last month, so that explains it. :0 Definitely tempted by the New Testament installment. I will keep you posted! Beth, good thinking. ;-) I love Living Faith! I used to subscribe to the print, and really enjoyed tucking it into my purse and pulling it out when I had a free moment. I keep meaning to re-subscribe! I don't think a journaling Bible is for me. I'd be too worried about writing in the book even though that is what it is mean for. I have a copy of Sacred Reading for 2017 but I haven't been using it lately. However a Bible reading plan makes me think of a more comprehensive plan to read through the Bible. I have a copy of Walking with God a Journey through the Bible by Tim Gray and Jeff Cavins. I like the way it explains salvation history and tells you what books to read so that the story is easier to follow. When I read the book many years ago, I think I just read their commentary (I don't remember the scripture being included in the book) and not the scripture verses recommended for each chapter. Perhaps I should pull it out again and read the Bible verses recommended as well. If I do I don't think I'll start with Genesis. Maybe with Solomon or the time of the kings after him. ooooo, great idea about Jeff Cavins. He came to mind as I was looking, because I have heard of parish using his Bible study series, and I know he approaches it from the different covenants over time, which sounded very appealing. I will check out this book! I've been doing a lot of reflective thinking lately on various Scripture reading plans, so this was a very timely post -- and I think I'm sold on "How to Read Your Way to Heaven" just on the title alone! Love your blog and can't wait to jump in on the upcoming Summer Book Club! Hi Kevin! Great to have you here! My friend Cristina alerted me to "How to Read Your Way to Heaven" and highly recommends it. :) And oh! You've reminded me about the summer book club poll. :0 I need to recalibrate the titles a bit based on feedback. I will work on that this week, and get the poll up early next! Cindy, the lack of breaks in the text was a deal breaker for me ultimately, I did not order it. My vision already isn't the greatest, and I could see that really killing my eyes. I'm very glad to get your in-person impressions! I also think that for someone who is artistic and wanted to draw in the margins, the lack of lines on the side is perfect, but for those wanting to write notes or prayers (like you and I), it's not so great.